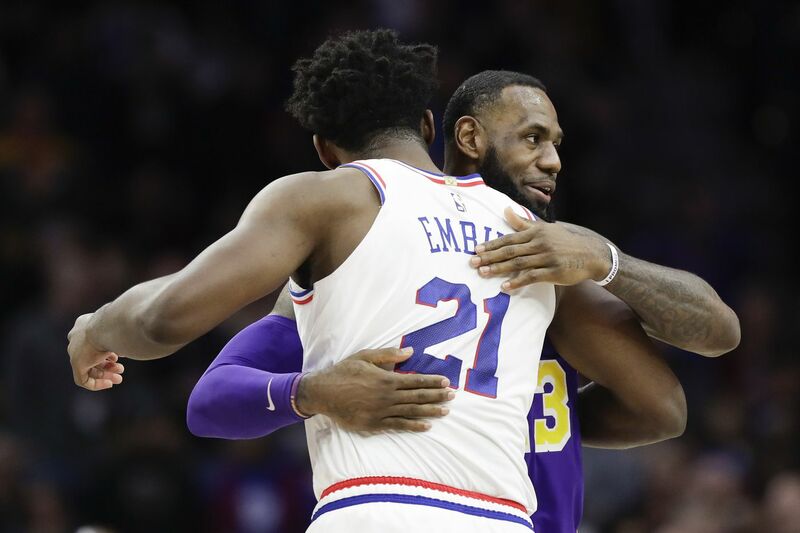 Sixers center Joel Embiid greets the Lakers' LeBron James. -- Tobias Harris is integrating smoothly into the Sixers’ starting lineup. His presence erased the spacing issues the team had in the 54 games before acquiring him before Thursday’s trade deadline. But one of his best attributes is his unselfishness. He’s willing to coexist with and, at times, take a backseat to his teammates. -- Furkan Korkmaz has been solid in the two games since the trade deadline. The reserve swingman shot a combined 5-for-7 and averaged 5.5 points and 14 minutes in the two games. He also showed good awareness on a pick-and-roll with Boban Marjanovoc in the first quarter of Sunday’s matchup. -- Jimmy Butler could become the “glue guy” of the Sixers’ starting lineup. The four-time All-Star’s number of shots have declined since being acquired in a trade from the Minnesota Timberwolves in November and will decrease more with the addition of Harris. But his passing, defense, and grit still impact games. -- The Sixers still need to work on their defensive communication. That was obvious on the game’s first possession. The Lakers ran a pick-and-roll with LeBron James and JaVale McGee. Butler, who was guarding James, fought through a screen by McGee. However, Joel Embiid left McGee for a second to guard James, who was dribbling the ball. That enabled McGee to get open for an easy score while being fouled by Harris. Best performance: Embiid gets this award on a night when Lakers power forward Kyle Kuzma torched the Sixers for 39 points. Embiid wasn’t far behind with 37 points and also grabbed a game-high 14 rebounds for his league-best 46th double-double of the season. Worst performance: This goes to Lance Stephenson. The Lakers reserve guard missed six of his eight shots en route to scoring four points. He also graded out at a minus-24 in 12:22 of action. Best defensive performance: This goes to T.J. McConnell. The Sixers backup point guard had a game-high three steals. Worst statistic: This goes to James Ennis’ missing all five of his shot attempts for the Sixers. Best statistic: I had to give this to McConnell’s shooting 6-for-6.